It is worth considering Western Digital SE 4TB Enterprise Hard Drive released by WD to target the users who need bulk storage. WD Se is a low-cost version of WD Re enterprise drive, which is very popular in the marketplace. It can also be introduced as a solution that is intended to consider where users need to place data in bulk and the data does not have to be moved frequently. Users go for solutions to collect a number of GBs at huge price to place important data so they do not bear any kind of loss in unwanted cases; this is where WD Se makes a difference. Moreover, WD had been searching for an alternative to WD Re enterprise drive, since it cannot be deployed in above five drives and WD Se is finally available as this alternative. WD Se is a complete enterprise level hard drive with perfect blend of capability and cost-effectiveness to help enterprises manage and organize the massive data. Besides bulk storage, the drive also offers greater reliability under RAID setup. As you know that WD Re comes in both interfaces, SAS 6Gb/s and SATA that range up to 4TB, it is being noticed that Re offers MTBF (mean-time before failure) of 1.4 million hours vs. 800,000 hours on Se. Another member in the series, WD Xe offers SAS-only interface, highest endurance, and MTBF of 2.0 million hours, while WD Se is designed with a great focus on high reliability, economical factor, and endurance, keeping performance the secondary aspect. Moreover, Se is only SATA unlike other versions with optional or standard SAS interface. In addition, Se hard drive consumes low power that adds days to its life. As per senior vice president of WD’s data center storage business unit, Richard E. Rutledge, now-a-days cloud technology is required in most organizations and cloud data center installations demand an affordable way to create storage systems on a large scale while maintaining the 24/7 reliability that is a mandate to minimize ownership cost. TLER in SE HDD is a feature that configures the amount of time that the drive takes to recover from a read/write error. In a RAID environment, limited recovery time results in improved and smart error handling. The feature increases stability and reliability by adjusting the head’s fly height in real-time at each read/write. Out of dual actuators, one uses conventional electromagnetic principles, while another uses piezoelectric motion. The technology aims to improve accuracy of head positioning. In addition, the ‘NoTouch’ technology assures that recording head does not touch the disk media ever. The abbreviation of ‘Rotary Acceleration Feed Forward’, RAFF, is implemented for having control over platters’ rotational and linear vibration on a real-time basis and compensating if required. With this, the shaft of the motor is secured and protected at both ends. It helps reduce vibration induced by the system and stabilize platters, which provide accuracy in tracking while read/write is being performed to deliver an optimum performance level. Extended burn-in testing is performed for each drive with thermal cycling to ensure reliability in operation. Implementation of dual processor doubles the processing power that directly maximizes the performance. 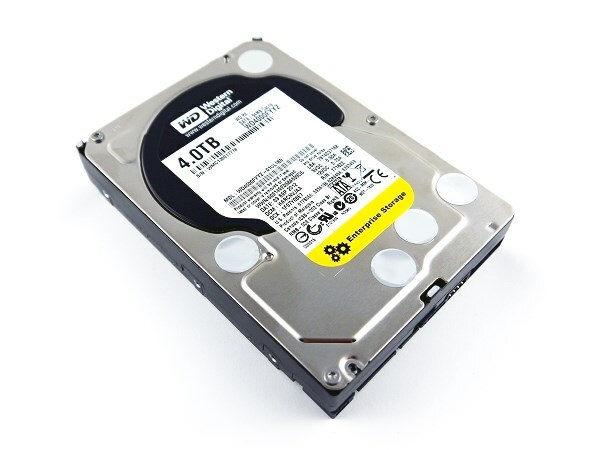 In the enterprise Se as well as Re drives, WD has included 800,000 MTBF (mean time between failures) rating that most hard disk drive manufacturers do not include. WD Se is the recent enterprise hard disk drive, designed and launched by WD with 3.5″ form factor. The drive is featured with 7,200 RPM drive spins, SATA 6 Gb/s, and offers range up to 4TB. Moreover, the WD Se is not developed with the 100% focus on performance, while the drive is more inclined to provide a cost-effective enterprise class solution and to store data in bulk. The drive also performed great in 128k environment and during load testing. As compared to its sibling WD Re, Se offers greater performance due to being able to perform in 128k testing environment. With excellent enterprise class features, it focuses on reliability and security. No special attention on performance, rather, is designed with only affordability and bulk storage in mind. As WD Se is bundled with classic enterprise level features at much lower price and offers a five year warranty, it is a great solution for enterprises that do not require ultra-high performance but own huge data. The drive is developed for bulk storage and offers good level of performance.